Is this still for sale? If so what's the price to get it shipped to 63010? 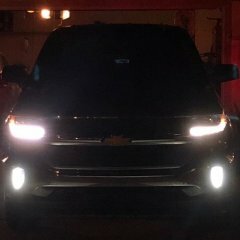 2016 Silverado OEM Chrome "Skid Plate"
I'm getting ready to take mine off, I would be willing to sell after this weekend. Was it easy to remove the front valance? I am working with a buddy to custom fab a piece of aluminum to get rid of the valance and still line up with the rest of the front bumper. Just as a frame of reference, my rims are 20x10 with a -19 offset. I have 305/55/20's as well, and as you can see they stick out but in my opinion just the right amount. Are you aware of any other way to completely remove the lower valance completely without going with the Mazzulla skidplate? To be honest I'm not 100% but I can say that I didn't rub too bad but still trimmed plastic. With your offset I would think you would clear suspension and would just be rubbing plastic if anything. I have the same setup (33x12.5 -19) but I have different wheels and tires. That's a good lucking truck!! Love the white! Good lucking truck! So you swapped the 2.25" blocks for the 1"?